Three students in the Kwantlen Polytechnic University Entrepreneurial Leadership program have turned their practicum into an opportunity to help kids in need. Matthew Wollin, Tyler Carmont, and Chad Nehring launched In-Need No-More in early October after laying groundwork and putting together a business plan for it back in August. 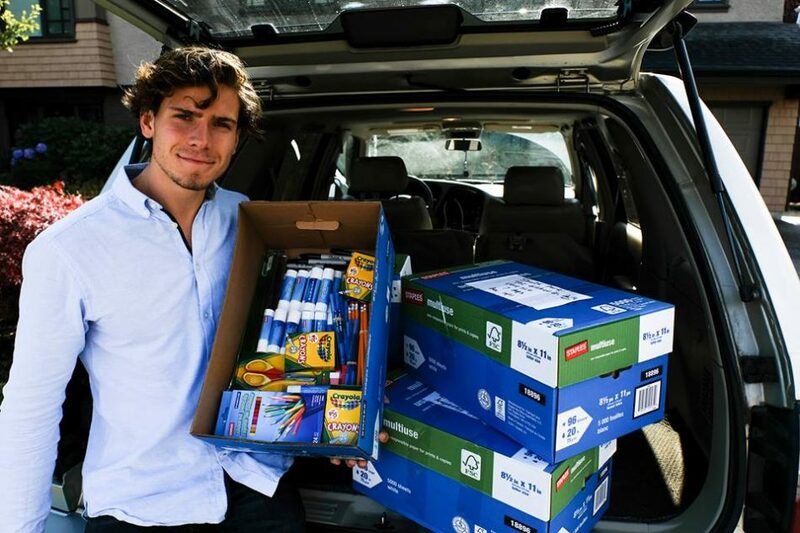 Their organization works with other businesses in the community to provide school supplies to underprivileged students in Metro Vancouver elementary schools. After Wollin, Carmont, and Nehring decided that they wanted to create a business that helps people in the community, they set out to identify a need. They spoke with the principals of several local elementary schools, and before long, a theme of students not having adequate school supplies emerged. By talking to the principals, they were able to identify 450 students in need across Metro Vancouver. The group then partnered with Staples to get a bulk rate on supplies and began looking to other businesses in the community for funding in exchange for promotion on In-Need No-More’s social media pages. One of the first businesses to get involved with In-Need No-More was local realtor Randy Mann, who committed to supporting 33 students with a contribution of $1000. Mann also agreed to match the contributions of other involved businesses, such as Century Group, NRI Distribution, and Buns Master Bakery, up to $3000. One problem for the creators of In-Need No-More was that the assignment guidelines required the businesses created for the practicum to be for-profit. The founders were able to get around this requirement by retaining for-profit status while investing all earnings that they make back into the business. The for-profit status of In-Need No-More presents a challenge for the company in convincing business and individuals to come on board. It also means that they are unable to provide tax receipts to participating businesses. So far, In-Need No-More has been able to meet its goals despite this technicality. Though the course project requirements end once the semester is over, Nehring says that this will not be the end of In-Need No-More. Its founders plan to refine their business model and keep the company going. This will likely involve becoming a non-profit organisation and pursuing a charity designation. They are also looking at expanding to address other student needs such as food and sports equipment. “We do want to pursue this once we’re out of the program because it’s such a good cause and it has helped build our network substantially, and it feels good to give,” says Nehring.